A while back, I got it into my head to design classes based on characters from fiction, since there are indications that AD&D rangers are really just Aragorns (why else can a woodsman specifically use crystal balls?) and the barbarian class owed a bit to everybody’s favorite Cimmerian. Thus were born the Beastmaster (to be published one day), the She Devil (again, you’ll have to wait) and today’s blog post, the Puritan. The Puritan can be regarded as a darker alternative to the Paladin (the turkey leg to the paladin’s turkey breast, so to speak). Enjoy – and HAPPY THANKSGIVING! Historically, the puritans were an English religious sect that operated in the 16th and 17th centuries. The terms “puritan” and “preciseman” were coined as insults; the people called themselves “the godly”. The puritans, by and large, were interested in returning Christian worship to what they believed was a purer form. In general, this involved problems they had with the trappings and rituals of the Catholic Church and its progeny, the Anglican Church. In England and the United States, puritans are often associated with strict moral guidelines, religious zealotry and witch hunts. Religious reformers offer little grist for the mill when creating a new character class, unless Robert E. Howard enters the picture. In 1928, Howard introduced Solomon Kane in a story entitled “Red Shadows”. Solomon Kane is an English puritan who leaves his country to adventure. As with many adventure-oriented characters of the time period, very little time is dedicated to Solomon Kane’s history, although the poem “Solomon Kane’s Homecoming”, we learn that he lost his love, Bess, at some point before he became an adventurer. During the course of his adventures, Kane battled brigands, sorcerers, pirates, vampires and slave-traders. Most of his adventures take place in Europe and Africa. Armor Permitted: Leather, ring armor, buckler. Puritans have a +2 bonus on saving throws made against fear and its effects. In addition, they have a +2 bonus on saving throws made against the spells and magical effects of creatures of chaos or evil. Puritans enjoy a +1 bonus to hit and damage creatures of chaos or evil. Moreover, their weapons are capable of damaging creatures normally only damaged by magical or silver weapons. When a puritan turns his gaze on a creature for at least one minute, he can determine that creature’s alignment. This cold stare is unnerving to those of a chaotic or evil disposition, forcing them to succeed at a saving throw or hurry away. A puritan’s devotion to the gods of law grants him the ability to turn undead, as a cleric, but at a -2 penalty. In addition, he can call down one minor miracle (i.e. level one cleric spell) each day simply by grasping a holy symbol or book and invoking the name of his Creator. The puritan does not have to memorize or prepare this spell in advance. At every odd level, the puritan gains the ability to call down one additional level one cleric spell, thus two at third level, three at fifth, four at seventh, and so on. Image: Puritan Jemuel Landes regards traveler “Steel” Sullivan with some suspicion – he claims to be a “football” star from the land of Cleve, but he’s probably a witch. 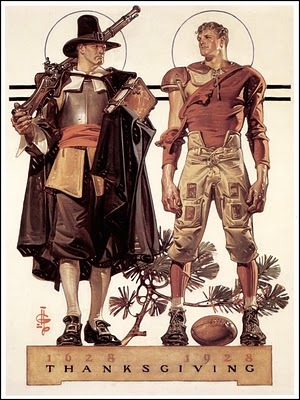 Art by J. C. Leyendecker via Golden Age Comic Book Stories. Cool. I really dig those level titles.